Ambitions is a South African television drama series which follows a young journalist who uncovers a corruption scandal in a displaced community and sets out to uncover the truth and bring the perpetrators to justice. Qhawe Ledwaba (Zikhona Bali) discovers that the displaced community of Supingstad are living in squalor on the back of broken promises by their government. She finds that the community has yet to receive the housing and facilities promised to them as compensation for their removal from their informal settlement to make way for the building of a new clinic. In the world of big business and 'tenderpreneurship', Qhawe knows there is more than meets the eye and sets out to uncover the story that will cement her career as an investigative journalist. When the community is mobilised by its leaders, Gauteng's goliaths aim to crush them with threats, manipulation and murderous actions. However Qhawe and the community are not such willing pushovers. Can they unite and defy, or will they quake under the fear and weight of these inglorious heavyweights? The series stars Zikhona Bali as Qhawe, Ashley Hayden as Jo Davey, Yonda Thomas as Dumo Cibane, Luzuko Nteleko as Wandile Cibane, Thulane Kubheka as Sbu Twala, Peter Sephuma as Athos Butshingi, Sipho Manzini as Robert Makhathini, Mary Twala as Gogo Lizzie, Solomon Sebothoma as Mandla, Kagiso Modupe as Thato, Bongani Masondo as Vusi Mthethwa, Gustav Gerdener as Thunder and Dee Rasedile as Yolanda. Supporting cast includes Thandy Matlaila, Nokuthula Ledwaba, Ayanda Borotho, Jòvan Muthray, Ayanda Makayi, Sibusiso Gaca, Thulani Msiza, Joseph Sedibo, Sphelele Mzimela, Christmas Mokone and Humbulani Masupa. 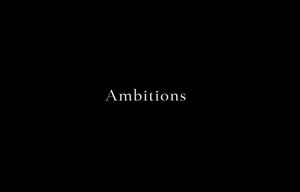 Ambitions is produced by Paw Paw Films, a division of Penguin Films. Roberta Durrant is the creative producer and directors include Catherine Stewart, Liezl Spies and Bantuza Mchunu. Music is by Alan Lazar from STX/Lalela Music. The script is by Thomas Hall, who headed a script development team including Trish Malone (the head storyliner), Rosalind Butler (storyliner), Gillian Breslin (storyliner), Julia Smuts Louw, Bongi Ndaba, Catherine Stewart, Neo Sibiya and Roberta Durrant. eExtra's first original drama Ambitions starts tonight and the Christian lifestyle magazine show Slice of Light starts on SABC2. The new drama takes on Sunday nights and the hot topic of land.